Good Morning my friends... Old and new. Today I have a wonderful recipe to share, but more I have a favorite blogger (from my old blogging life) that I want to introduce. You've heard the term, "brother from another mother", Well Penny and her husband Dave I consider my sister from another mother. 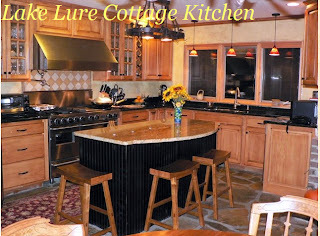 I enjoy everything about Penny, her husband, her culinary skills, her life in retirement and the glimpses that she shares on her blog, LAKE LURE COTTAGE KITCHEN. The first thing you will notice on her blog is her kitchen. Hey, makes sense, if you are going to name your blog after a room, you oughta show it. And speaking of kitchens, Penny does an annual event that I just love. Ever want to be a fly on a wall and take a peak at someone's kitchen. Penny hosts an annual (well, two so far, but I have great hopes for this year) event she calls Kitchen Reveal Day. Click those blue letters and you will be magically taken to her old posts which show images and links to some of the best bloggers who share the look and tips of their kitchens. Old and modern, big and tiny, rooms with views and rooms with unusual nooks are all revealed. Kitchen Reveal Day is among my favorite days of the year (yes, mine is up there both years... very funny to read those old posts... but I digress). Penny and her Dave (her husband is named Dave, so she always comments about "her Dave" to me) do indeed live in Lake Lure, NC. But once a year they load up the car and head to a winter home in Florida (I believe before retiring they lived in Florida and summered in Lake Lure. Now I think they consider themselves living in Lake Lure and wintering in Florida). I am always a little sad to read when they head south. Just seems they ought to live their life in their beautiful lake front home year round. Penny does a lot of decorating and her Dave has done LOTS of renovations (adding entire floors to an existing 600 sq ft cottage). You have to dig deep into her archives to find her renovations posts, but the place has certainly come a long way since she started her blog. Her Dave does an annual motorcycle trip. 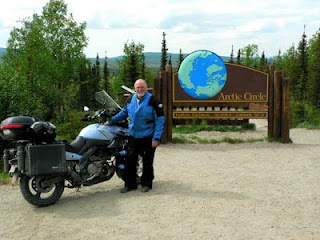 This year Dave did the trip of his dream, starting in NC and riding cross country, internationally and ending above the Arctic Circle in Alaska! And to the right, you see he indeed finished (well, he still had to get home) the ride. Penny met Dave in Alaska for a trip of a lifetime, touring the last American frontier by bike! Penny made several posts of their trip, and she has convinced Dave to start blogging with his own travel blog, Riding With Dave. You know how this works, click the photo or the blue letters to read of Dave's adventures. I take a look at his map each year and see her Dave rides only a fraction of an inch from Kansas City (of course it is a map of the entire US, so that could be several hundred miles). Despite bribing him with a hot shower, comfortable bed and the story of how my Jackie was escorted to the city limits of Sturgis, SD by the police and told to never return (a great story every biker would want to hear), I have not convinced Dave to take a break from his ride in KC... But next year I will try again. 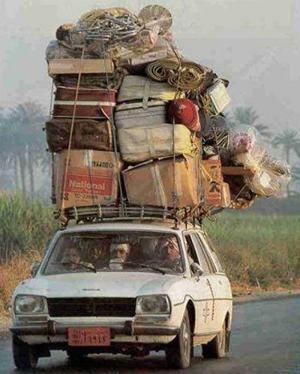 And something to look forward to, this was Dave's dream trip. Penny has made a deposit on an apartment in Paris where she will stay longer than a tourist for a feel of the left bank and Parisian life! Looking forward to those posts. A very special Dinner Party! I could go on and on. Penny, her Dave and her blog is just one of my very favorite people. But, we have never met. I have a handful of bloggers that I envision meeting one day. Penny is at the top. And one more story. See that picture just above. 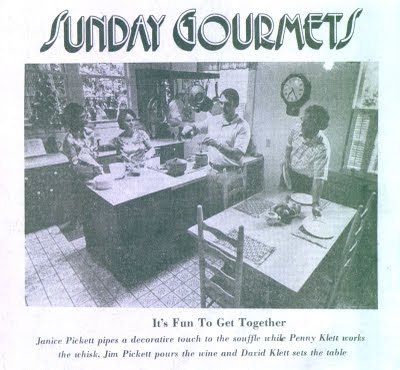 That is from a newspaper article that was written about a skinny (her words) Penny, her Dave (with hair) and their friends that took cooking lessons together (from celebrity chef from the past, author Irena Kirshman back in 1975. 34 years later, their friends got together and recreated their dinner. Just one of those posts that stuck with me for nearly two years. Wonderfully written, a great story and just a fun read. A perfect example of how much fun it is to follow Penny's blog. I have stolen ... um I mean been inspired by several of her recipes (just two days ago I mentioned a red pepper pesto I added to my steak pinwheels that has become a monthly staple for me to make). She has always been encouraging and supportive no matter what damages I did to her original recipes. 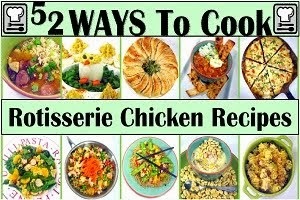 In fact, when I had a question about this recipe while I was making it, she was able to answer an email for me. As hobbyist cooks go, she is about the best around. Today is one of those unusual days for me (only 3 times this month). I will boldly make changes I think are appropriate for my tastes (or sometimes budget) to just about any recipe. I simply can not leave well enough alone. When I do make what I view as significant changes, I will print out a recipe and proclaim it as my own (but always with an "Inspired by" credit). Today I added a few sauteed sweet onions, used chicken breasts instead of her suggested chicken thighs, but other than that, this recipe is Penny's. So, click the photo to the right. 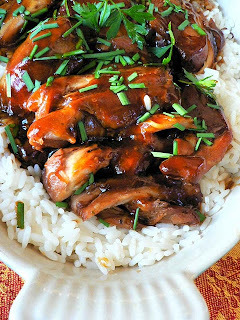 It will take you to Penny's recipe for Crock Pot Teriyaki Chicken. 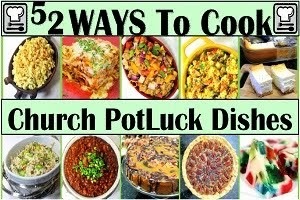 It was very easy, since it was made in a crock pot, made good use of my time and best of all, just amazingly good. Thanks Penny... a real winner! 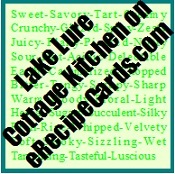 So, if I have tweeked your interest in Penny and the Lake Lure Cottage Kitchen Blog, head on over and say HI for me! And for a quick look at what she blogs, click on the logo link image to the right. You will see all the eRecipeCards that Penny has submitted to eRecipeCards.com. You can add her recipes to your eRecipeBox (once you have a free account). Labor Day is coming... Sadly, there will be a few bloggers who say things like, "The last days of this years grilling season". For me, Fall is the BEST time to proof yourself king of the grill. No sweaty nasty cooks serving up in 100 plus degree days (with extra humidity to make everyone even more uncomfortable. Nope, for me, summer grilling is overrated. Give me a crisp cool evening, and more likely than not, I am out on the grill. My little Cul de Sac to the world has a pretty competitive back yard. 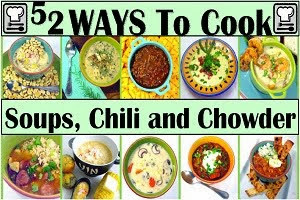 Neighborhood chili cook off (two year champion), experienced competitive smokers (2 veterans of the American Royal (largest competitive BBQ contest in the nation)) and more than a hand full of competitive foodies. When I want to, I can show off. Like I said, there is a group of us, when we step up to the plate (walk to our grill), like EF Hutton, people listen (neighbors take a peek). Hands down, these are the best. For the teetotalers among you, a brat and a root beer works well also (root beer is made with lots of amazing spices and root vegetables, will flavor a brat nicely). 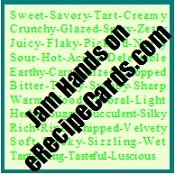 Click the logo to be taken to the Jam Hands Blog! Jam Hands is also ALI, a former girly girl now living mascara free in God's country, Montana! Mother of two, and writer of one of the best blogs I have ever seen. Ali has been blogging since 2004. She did the near impossible, starting over with a fresh name, URL and look. Like moving from a high school blog to a college level blog, Ali has become... practically perfect in every way (alright mom of two, extra points if you get the reference). I dream of being as organized as she is. Take a look at her "Parties" page. It not only features her personal button link up party button (Recipe Sharing Monday), but also features a seemingly never ending list and buttons of the blog hops that are available to bloggers to participate in. 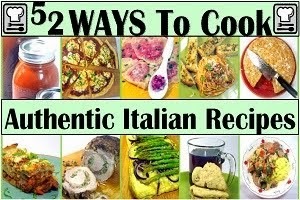 Are you best at pasta, there's a link up party for you to contribute. Meat, Ice Cream and sweets... they all have their parties. And if you are crafty or need to be inspired to be crafty, plenty of these. It is a great service to have all those buttons and links in one place... well done Ali! Oh and BTW, if you take a look at my left side bar you will see the parties I play at. Very fast, very easy to participate. All of those buttons are linked to blogs who submit to eRecipeCards.com. I want everybody to be a success! So if you are hosting a link up party and I have not added (or participated), please drop me a comment. Her "New Here" page. 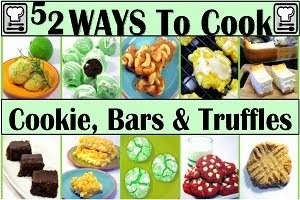 She has links to favorite recipes, healthy recipes, indulgent recipes, cooking from scratch, cooking from a box... In other words, she cooks like most people, a little of this, a little of that; but always a joy to visit! Take a few clicks through her pages and you will see what I am talking about. 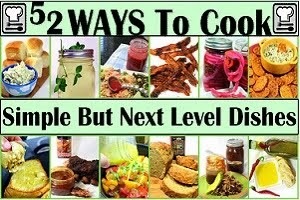 Spot on recipes and enough how-to's to make you think you can do it too. Is it wrong to post recipes? Making a quick & easy photo recipe index"
Especially take a look at the "10 things I hate" post. I break my fare share, but I can justify them in my own mind. But, read over the post, see how many you break. If you can't justify them, at least consider why you do what you do. Somebody needs to write an eBook on how to be a food blogger. Nice start with these posts Ali. 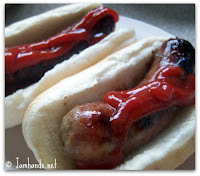 Like these Grilled Beer Brats!!! And yes Ali, I am that excited (using too many exclamation marks is one of the 10 things she hates about my blog). I did make a tiny change, a BIG change and added a "three exclamation point" extra because I was sharing these with one of those competitive grillers in my back yard. Sorry Ali, I just can not leave well enough alone... Even the beautiful in their simplicity recipes like this one. First is a tiny change... When I make Beer braised brats, I always poke little holes in them with a toothpick first. Brats have a casing around them that resists tearing. It is also not porous. I want the beer to get in and some of the fat to get out as it renders down. The casing will open tiny holes on their own when you grill these. But by poking a couple dozen holes throughout the casing while you braise the brats you allow the beer to seep in and flavor the brats. And a bigger change... I changed Ali's cooking method by changing the amount of her ingredients. Ali's post uses 3 beers. I assume that this means she is completely covering the brats in beer and simmering them. Fine, works great. 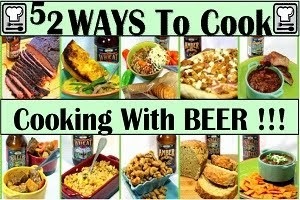 I also used three beers (5 actually), but I only cooked with one. Any guesses what I did with the other 4? Braising is very simple, form a base of onions (sauted a bit so they are soft). Then rest the brats on top, add the beer so that it covers the onions and a bit of the brats. This is plenty (in my opinion). Cover and simmer for 10 minutes. When you open the lid, you will see that the onions have settled and the brats are at least 1/2 way covered. flip the brats and simmer for another 10 minutes. Home made whole wheat, Sesame Seed/Garlic and Sea Salt hot dog buns. Nah, sorry Ali, that last sentence just doesn't look right... Home made whole wheat, Sesame Seed/Garlic and Sea Salt hot dog buns!!! There, that's better. These deserve 3 exclamation points. But those bun posts are for another day. And that's it... No real need for a recipe here, Onion Slices, beer, Brats and braise. Once the brats are cooked, move to the grill and crisp them up. Only a few minutes on each side. Serve them soft and hot in the center and crispy grilled exterior. And save those onions. They taste AMAZING on the brats. And just la de da, la de da when your rival for the neighborhood chili cook off comes over for a quick grilling session. Start to intimidate early (that's why I made the buns). While I always urge you to visit the blogs I talk about. I REALLY, REALLY urge you to take a tour of Ali's JAM HANDS blog. Look at the beautiful clean look her blog has, read over her recipes and pay close attention to her "BLOGGING" category; lots of great information (some deserve three exclamation points). I know after being set in my ways with over 700 posts that I have written, I am going to try my best to be a better blogger from reading her tips. While I have tried to have a little fun with the three exclamation points, Ali, I do pledge to try to only use an exclamation point from now on when i am actually excited. But that will be hard, as food and food bloggers is exciting! I love my hobby!!! So, if I have tweeked your interest in Ali and the JAM HANDS Blog, head on over and say HI for me! And for a quick look at what she blogs, click on the logo link image to the right. You will see all the eRecipeCards that Ali has submitted to eRecipeCards.com. You can add her recipes to your eRecipeBox (once you have a free account). Has everyone survived this weeks "Storm of the Century"? Hope your power stayed on, hope your trees stayed up and your lawn furniture did not end up in the next county. I am ashamed to admit a certain amount of schadenfreude. Living in tornado famous Kansas, with every warning, watch and "Storm of the Century" heading our way seemingly weekly, we have gotten used to family and friends calling to ask us if we were OK; I made more than one call last night checking up on my friends and family on the east coast. With the exception of one broken window from a neighbors lawn chair, everyone I checked in with weathered the storm. I do hope all my blogging buddies fared equally as well. And in the aftermath of yesterday's "Storm of the Century", Today is a perfect chance to salute our best and bravest. Those who serve, who put themselves, if needs be, where other's fear. Lately (last ten years), we have asked more of the US Army than ever in our history. 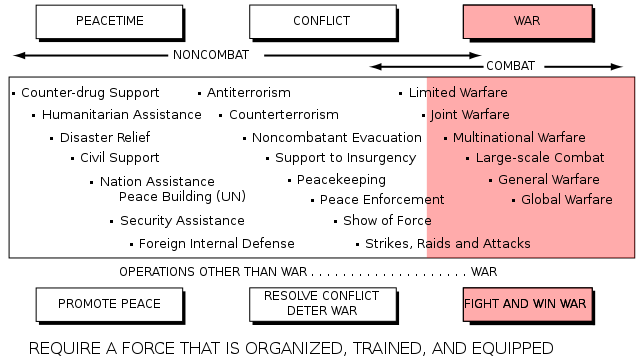 In researching this post, I came across a visual aid showing the duties of the US Army. Never in our history have we asked so much for such an extended period of time. 2 land wars, ongoing (seemingly permanent) peace building presence in a hostile environment, and yet the envy the world for our capabilities. All of this is being handled 100% by a volunteer force (although the use of the national Guard in these areas is a sin... but that's a debate for another place). 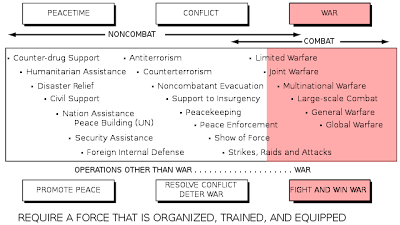 Take a look at the chart, these "volunteers" are assigned duties including disaster relief and civil support as well as humanitarian assistance. While the morning after makes for snide comments about "the storm of the Century", it was and is always reassuring that in addition to the war games shown on TV, the US Army stands ready in the event of the big one here at home. Which leads me to Carolyn. One of America's proud support staff. She is a stay at home mom. Home being on post at Fort Leonard Wood. 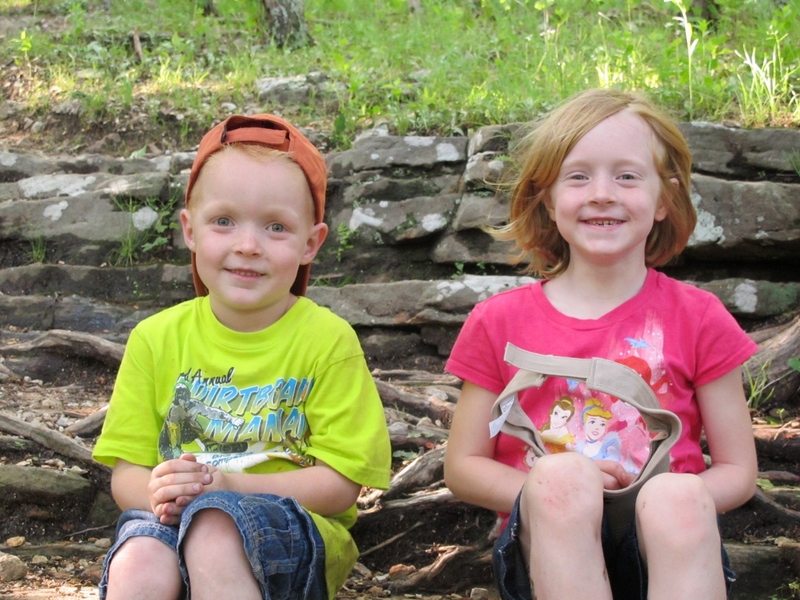 She has two beautiful red headed children. 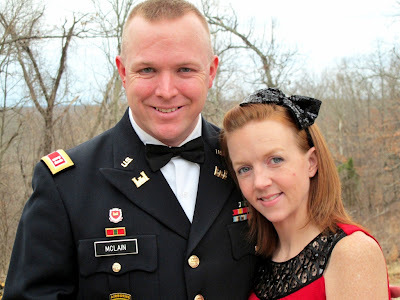 She is also wife to a Captain in the United States Army. If you will forgive one last "rant", a few months ago when Congress and President Obama were pondering a government shut down, it was decided that the US Armed Services were to be assigned "non-essential" for pay during the shut down. Meaning, since they had pledged an oath and had a legal and moral commitment to see their mission through, the government could count on their continued service during the shutdown without pay. If the shutdown had lasted a day, a week or a month, while the Captain (and privates and generals) could have counted on 3 hots and a cot, the Army wives would have had to make the best of uncertain paychecks, not knowing when they would start or even if the back pay would be made a priority. Just seems the least we could do is to assign paying our military families an essential part of the US budget. Shutting down national parks and not paying (or delay paying) a paralegal working for the Dept. of Justice (my wife) is "just" a terrible thing, adding this uncertainty to the pressures of an Army wife is unconscionable. BTW, Congress and President Obama's determined their pay to be "essential". 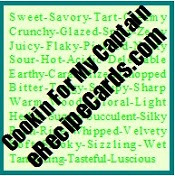 Carolyn has a WONDERFUL blog, aptly titled, Cookin' For my Captain! From Lettuce Wraps to White Chocolate Dipped Candied Orange & Pistachio Marzipan Bonbons (really, take a look, they are STUNNING! ), she really shows her chops. Cooking for her Captain (and the two children) looks amazing! 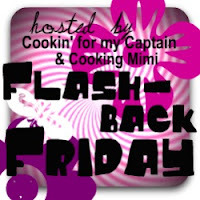 FLASHBACK FRIDAYS is a chance for bloggers to show off a favorite post from you past. It's a unique post, not just a chance to "show off" something you did this week, but they encourage you to post a favorite dish from a month, three months or 5 years ago. I love the concept of looking back as bloggers. One of the best ways to improve and one of the best ways to see how far individually we have come as bloggers! I'm in, and planning to make Fridays with Carolyn a habit. Made a post this morning to their latest hop, as well as my absolute favorite post from my former life as a different blogger. I had a grilling day planned last week. Beef is actually becoming a rare treat for me. Lots of chicken, fish and veggies, but because of the cost and somewhat because I am old and my colon is not what it used to be, I have decided to cut back. But, there was a wonderful sale that ignited the inner caveman in me... MEAT, who needs that other white meat when you have BEEF! And better still, when I plugged steak into the search feature on eRecipeCards.com, I found Carolyn's recipe featured steak wrapped in BACON! BACON BACON BACON BACON BACON... I like BACON! As most grilling recipes are (and should be), Carolyn's had a limited number of ingredients. I pimped mine up quite a bit, but stayed true to the ingredients and presentation. First, Carolyn used a flank steak for her recipe. I had a Kansas City cut (some people (east coasters) call this a New York Steak). Much thicker, so I whipped out my manly meat pounder and manly pounded my... um... my cut of beef. to make a flat rectangle. 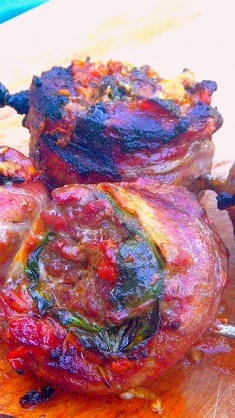 Next, Carolyn stuffed her pinwheel with red peppers. I have a recipe for a red pepper Pesto (thank you Penny from Lake Lure Cottage Kitchen) the pesto adds garlic, Parmesan cheese, and most importantly, Olive oil to the steak. I stuffed the pinwheel and let it rest for an hour, allowing the pesto flavored oil to seep into the meat, adding a great deal of flavor. And, while I was at it, I like blue cheese on my steak. So a few crumbles of Stilton Blue Cheese topped it all off! Carolyn has a delicious sounding Buttery, milky Cream Cheese Sauce that she used on her steak. Since I had an essentially marinated steak (with the pesto) and the Blue cheese embedded inside the pinwheel, I chose to serve this without a sauce. 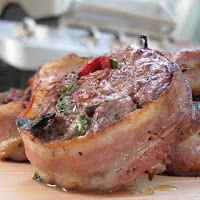 Please, if you are interested in trying a pinwheel steak recipe (or a terrific creamy sauce), take a quick look at Carolyn's ORIGINAL POST of this recipe. Click the photo to the left or the blue letters to see her version. This is adapted from a recipe by Penny of LAKE LURE COTTAGE KITCHEN, one of my favorite bloggers who I will be talking about soon. This is VERY EASY and VERY fast to assemble as everything goes into a mini chopper, whir for a few seconds and done! about 2 ounces of a good quality Blue Cheese (a little goes a long way. may want to increase if using those tubs of blue cheese crumbles (not as strong a taste). And you need skewers. I had cute metal ones (with bull heads on them). 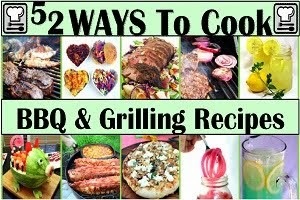 If you use wooden ones, be sure to soak in water before popping on the grill. Pound your... um... steak flat and in a rectangle (always trim off the HARD pieces of fat from your steaks. these cook into gristle and will never taste good). And I let mine sit in the fridge for an hour while the juices of the pesto marinated the steak. Since the steak was pounded flat and the pesto coated so much of the area, an hour was fine to get the whole thing flavored. there are advantages to the pinwheel preparation in addition to the dramatic presentation. And serve with some grilled Cinnamon Sweet Potato slices and some wonderful Kale Chips and you have quite a meal! And, I think this would work just as well with chicken or pork. Thanks Carolyn, just a wonderful recipe. I was certainly inspired. 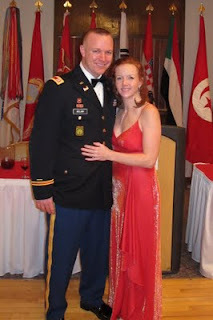 And a personal thank you for the sacrifices all Army wives (and now husbands) make to allow their spouses to serve. And pass my thanks on to your Captain as well. Using the power of the military should always contain a human element. Real people with real families follow orders with no complaints as they swear an oath to do. We should all remember the faces of these individuals before we commit the faceless concept of the US military to foreign soil. 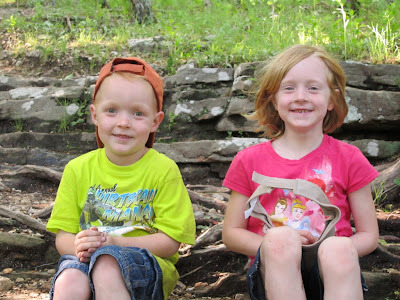 And Carolyn says...My adorable red-headed children! So, if I have tweeked your interest in Carolyn and the Cookin' For My Captain Blog, head on over and say HI for me!